Local eatery P.J. 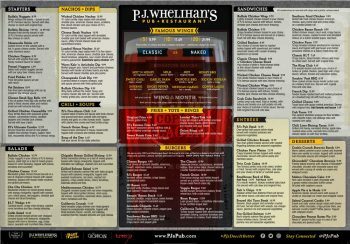 Whelihan’s unveiled a new menu now available at all 14 locations in Pennsylvania and New Jersey — including its locations in Chester County in Dilworthtown and Downingtown. 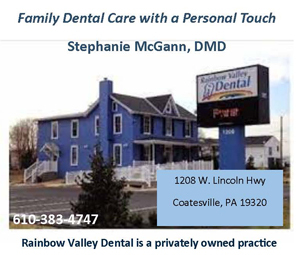 With a refreshed new look, the sleek and sharp menu is studded with additions chosen specifically in reaction to the demands and purchasing history of loyal P.J. Whelihan’s customers. Headlining the P.J. 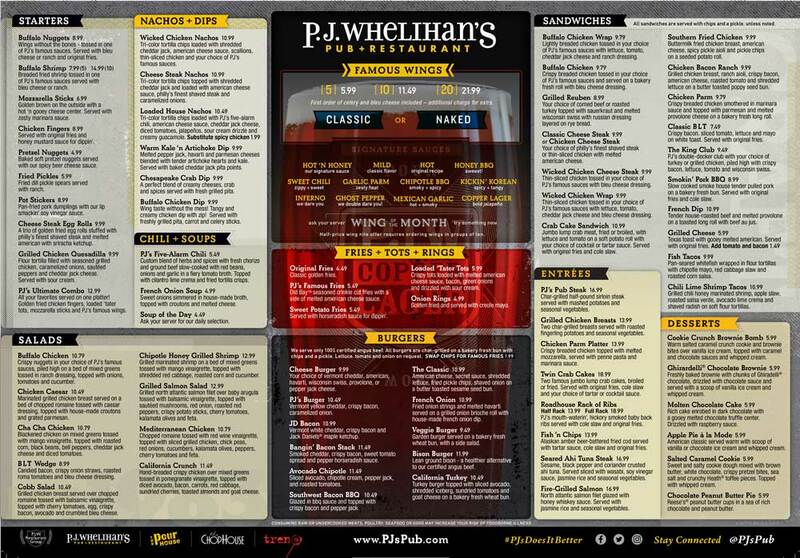 Whelihan’s menu update is the addition of naked wings, now available alongside their classic breaded counterparts with any of P.J.’s signature sauces. By popular demand, Ghost Pepper, Mexican Garlic, and Copper Lager (P.J. Whelihan’s signature beer brewed by Victory) sauces will take permanent slots on the menu, expanding the offerings to an even dozen in addition to the changing Wing of the Month sauce. Two chicken sandwiches were tremendously popular in their limited runs and now grace the new menu: buttermilk fried chicken breast is the star of the Southern Fried Chicken sandwich, served on a seeded potato roll with American cheese, spicy pickle aioli and pickle chips ($9.99); and the Chicken Bacon Ranch sandwich marries grilled chicken breast, ranch aioli, crispy bacon, American cheese, roasted tomato and shredded lettuce on a butter toasted poppy seed bun ($9.49). Adding some variety to the menu, two new shrimp items are back as well: the Chipotle Honey Grilled Shrimp Salad served with a mango vinaigrette, shredded red cabbage, roasted corn and cucumber ($12.99); and Chili Lime Shrimp Tacos filled with grilled chili honey marinated shrimp, apple slaw, roasted salsa verde, avocado lime crema and shaved radishes ($9.99). A twist on the signature P.J. Whelihan’s wings, Wicked Chicken Nachos are a crowd pleaser loaded with shredded cheddar jack cheese, American cheese sauce, scallions and thin-sliced chicken doused in a choice of PJ’s famous sauces. Rounding out the new class of favorites is the Cookie Crunch Brownie Bomb, warm brownie and warm salted caramel crunch cookie bites over vanilla ice cream, topped with caramel and chocolate sauces and whipped cream ($5.99).